“Fancy” green cheek conures are just another name for yellow sided green cheek conures, pineapple conures, or normal green cheek conures with extra coloring. But I checked – there’s really no such thing, and breeders started using this term in the 90’s. Where to Buy Fancy Green Cheek Conures? 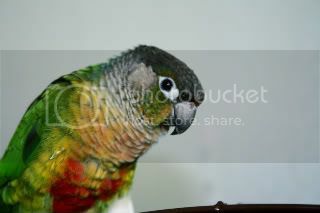 So, Do Fancy Green Cheek Conures Exist? Fancy green cheeks do exist. The fancy mutation also applies to budgies and other parrots. Fancy budgies might be a tiny bit more colorful, or have heart shaped markings. A fancy marking is pictured in the conure above – just a normal or yellow sided mutation with a little bit of extra coloring, but not enough extra coloring to be a new mutation. Fancy, is the equivalent to a weak red factor sun conure. Fancy green cheeks have pink chest feathers, instead of plain yellow chest feathers. 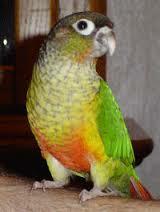 Fancy green cheek conures are yellow sided conures with extra pink chest feathers. The term fancy gets mixed up a lot with “any mutation besides a normal green cheek.” As stated, uneducated pet shops, petco/petsmart/petland will charge extra by using the “fancy” label. A fancy green cheek is a yellow sided green cheek with extra pink chest. Not all mutations besides normal are fancy green cheek conures. So, you might ask, is my bird a fancy green cheek, or a plain yellow sided conure? What isn’t a fancy green cheek: Mutations including pineapple green cheeks, yellow sided green cheeks, turquoise green cheek conures or cinnamons – don’t trust pet stores that label all green cheek mutations as “fancy.” Don’t pay the extra cost of any green cheek conure labeled fancy – learn the difference between yellow sided, pineapple, turquoise and fancy first. Fancy green cheek mutations happen by accident, or on purpose. Sometimes, a fancy green cheek is just born with extra yellow or pink chest feathers. Other times, breeders work to dilute pineapple conure mutations, to get just a little bit of “extra” coloring which will make their birds stand out. What is a pineapple conure? A pineapple is a mutation achieved by breeding a yellow sided green cheek and a cinnamon. This cross breeding results in a brightly colored yellow and red bird, resembling a ripe pineapple. When pineapple conures breed with yellow sided green cheeks, the babies that result have just a little extra pineapple coloring – thus fancy green cheek conures.